The sight of those golden arches on the side of the road is as ingrained into the American consciousness just as much as any bald eagle or cracked liberty bell. No matter your feelings on the McDonalds brand, you can't deny the success they've had. Both in business and in worldwide presence. Last year alone, McDonald's made $22 billion dollars across 119 countries, all around the globe. And it all started humbly in Southern California, with a single chain restaurant opened around 1955. What can we learn from the success of the McDonald's franchise, and how can we apply these lessons to our own businesses? Read on, and we'll break down everything you need to know. McDonald's has over 37 thousand locations, but you can bet that upon entering you'll have almost the same experience no matter where you are. Upon McDonald's first foray into massive expansive in the 60s, Ray Kroc launched the Hamburger University. This was a training process designed to outline his vision for McDonald's experience. This experience would need to be implemented exactly in every location around the country, and later around the world. Every location would give the customer the same experience. This can be huge in creating customer loyalty. Customers, more times than not, will spring for the experience they know they'll have over an unknown one. Consumers don't like taking risks -- establishing a shared experience that consumers can count on is a great way to keep them coming through the door. It's a phrase almost every in the world is familiar with and even expects. But at its origins, it was just an attempt to get consumers to buy more product. With simple phrases such as that one, McDonald's became kings of the cross-sell practice. They allow consumers to purchase an item they want, and then ask if they want to add value to that item by adding an additional item. In some ways, it's similar to the "you may also like..." feature of an Amazon shopping page. Upselling your customer without making them feel pressured or overwhelmed is a careful art. Allowing a customer to make their own decision first, then offering a second item, allows customers to be worked up to the interaction. McDonald's is definitely not afraid to take risks. Every few years, the brand introduces a major change or innovation to their stores intended to keep them relevant in the cultural conversation. Back in the 1970s, McDonald's introduced the first drive-thru to serve military customers that weren't allowed to leave their vehicles. And in the past few years, McDonald's introduced breakfast, then all-day breakfast, and then an expanded coffee menu. 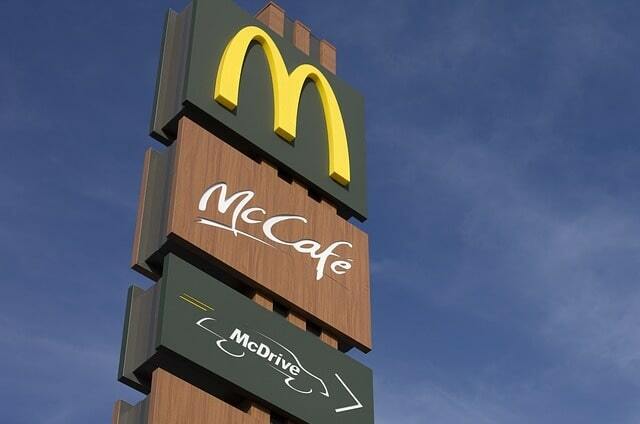 Today, McDonald's continues to expand their McCafe coffee line into retail stores around the world. Take a look at your business and your industry. Crunch some numbers. Where is there an opportunity that you could take advantage of? Put in the work, use visual merchandising software to stay organized, and find what new opportunities could benefit you. This restless, always-striving-for-more innovative behavior should be a model for any aspiring business. There's always more you can provide a customer. You can't be afraid to take a few risks to supply the best. McDonald's has had to weather a certain number of public relation storms over the years. It is no secret, of course, that their food isn't the healthiest option for you. But despite this, McDonald's has managed to hold on to public goodwill for over half a century. This is due to their impeccable brand maintenance. They're able to create a positive association with those famous golden arches and push positivity and fun in their ads. "I'm lovin' it" was a hugely successful branding effort that kept customers coming back. And you can't understate the value that frequent philanthropy has for their image. The Ronald McDonald house has been a charity intended for helping children's futures for many years. McDonald's runs a number of services that are intended to give back to their local communities. This gives customers a positive feeling when they decide to order their burger. They feel good knowing some of that money is going back to the community. People have busy schedules and there's not nearly enough time in the day. Providing convenience and ease for a consumer can be one of the most valuable things you can give them. McDonald's has perfected the art of this. Think about stopping by a McDonald's location. There's probably one (or maybe two, or three) located conveniently on your way from home to work, or vice versa. There's a drive-thru, so you don't even have to get out of your car. And you probably already know your exact order and what you're looking for. That makes the entire transaction as McDonald's as easy and smooth for the consumer as possible. Now, it can take years of brand-building and some serious funds before you can reach this level of convenience with your own company. But it can't hurt to start thinking in this general direction: how can you make a consumer's day easier? How can you make their interaction with you as efficient as possible? Come up with a good answer and you'll likely have customers lining up for years to come. The McDonald's franchise is one of the most successful businesses in the world. And while their size and model may be much different from your own, there's so much you can learn from studying their success. The above reasons are just the beginning.